Fine Fiber Notes from Nicki: Great Service! Gosh! 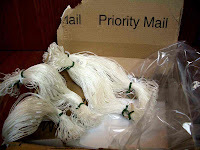 I ordered these extra heddles from Village Spinning Tuesday morning...and got them in the mail today at noon! Seems to be about 48 hour turnaround! That sure is fast! So now I can move forward on my taquete project. Hmmm...warping with polyester sewing thread with those white cloth heddles is not one of my favorite things. At least the thread is not quite white...it's a lemon yellow and a light mint green. Perhaps, I will add this to my to-do list and work a different project. On the other hand, there are only 128 ends.